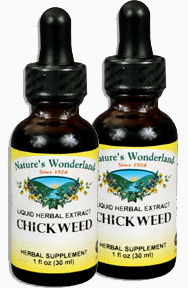 Chickweed Extract, 1 fl oz / 30 ml each (Nature's Wonderland) - Penn Herb Co. Ltd.
Chickweed is also a popular ingredient in many herbal weight management formulas because it promotes fat metabolism and supports healthy appetite control. AMOUNT PER SERVING (500 mg/ml or 30 drops): Ethically Wild harvested Chickweed Herb (Stellaria media). OTHER INGREDIENTS: Grain Alcohol (45-56% by volume), Deionized Water. Free of: milk, dairy, egg, fish, shellfish, tree nuts, peanuts, wheat, gluten or soy. 30-60 drops in water or juice, 2-3 times daily, or as needed. Shake well before use.